Everyone who runs an ice cream parlor has the same problem. 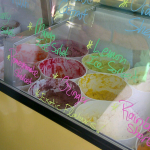 What is the best way to label the ice creams and sherberts in the cooler. This is particularly an issue if you are serving hard ice cream in tubs. You can use clip on marker or white placards on the front of the cooler but the clips fall off and the effect is kind of drab. 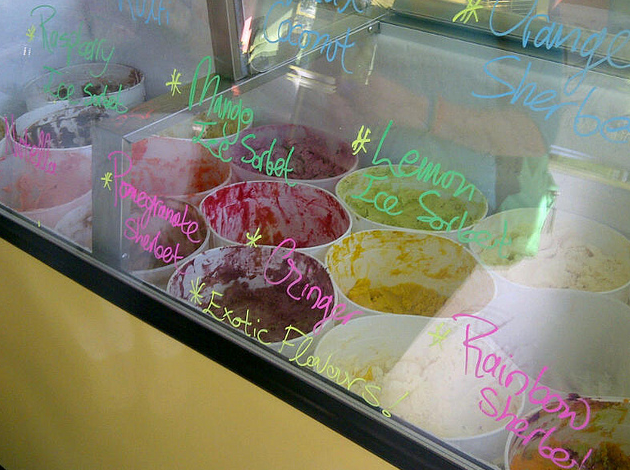 To liven up the front of your cooler try writing the flavors of your ice cream right on the front of the cooler window. To do this you want to buy yourself a set of 1/4 inch Chisel Tip waterproof window pens. These come in many different neon colors and are available at a specialty site called Neoplex.com. However some craft or art supply stores in your area may sell them. These are not only great for drawing on your cooler glass but you can draw on your front window glass as well. These are semi-permanant markets that are easily removed with most window cleaners. This means that if you have to switch your tubs around or replace a flavor in your cooler you are not faced with having to deal with insertable cards or other hassles. What is also quite great about these markers is that they suit the merry atmosphere expected in an ice cream parlor and you can get quite artistic in your use of them. Donna Lypchuk 2011. All Rights Reserved.